Clive Thompson LRPS Photography: Ansco film packet rear from 1940s or 50s. 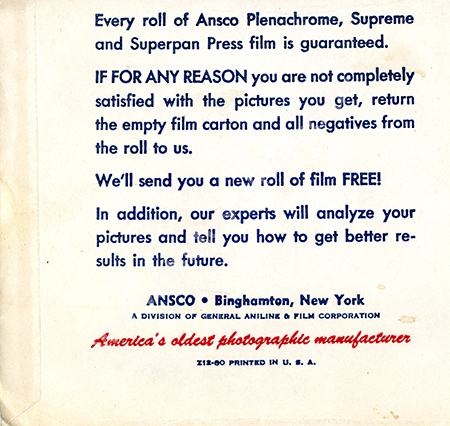 Ansco film packet rear from 1940s or 50s. Ansco film packet rear from 1940s or 50s that film negatives and prints were delivered in or picked up from the chemist / drug store / photo shop. For commercial use of this photo, including use on another website, please visit Alamy.com and search for M3N9FY or for the front of this packet search Alamy.com for M3N9FX. For a one-off print please see below.